Potato and chickpea cakes are an extreme form of comfort food, while only made with whole plant based foods. If you love potatoes and curry, you will love this recipe! Using only a few and simple ingredients, this should definitely become a go-to recipe for when you have left over potatoes. If you are not a fan of coriander, you can use basil. I haven’t personally tried it, but I can imagine that the flavours would work very well together! These potato and chickpea cakes are great as either the highlight of the show, or a side dish or snack. Whichever way works for you. I personally love eating them on their own, because they are just that good! To store them, I would keep them in the fridge for a few days, and then bake or fry them when you are ready to eat them. I am sure they will microwave okay, but you are looking for that browned hardened outside for extra indulgence. Yes. Indulgence. I would not recommend freezing these as the texture of potatoes become quite grainy/mealy during the freezing process. 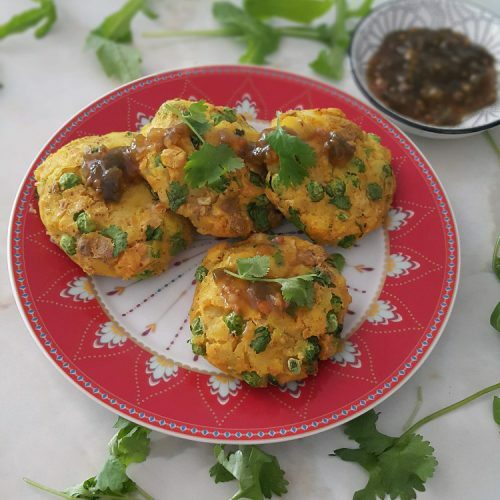 The ultimate comfort food, potato and chickpea cakes with a hint of curry. 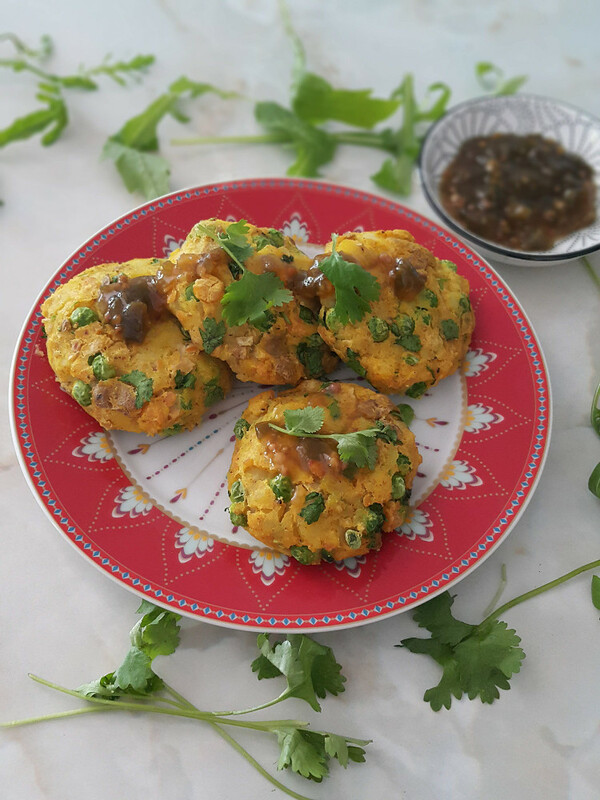 Top with your favourite spicy chutney and voila! These can be the main dish, or served as a side or snack. Whichever way you like! Cut the washed potatoes into smaller chunks, and boil in water for about 25-30 minutes until soft. I keep the skins on. Meanwhile, drain and rinse the chickpeas, chop the coriander finely, and thaw the peas. When the potatoes are done cooking, mash them with a potato masher in a large bowl. Then add the chickpeas and mash them all together. Once everything is mashed and incorporated together, add the peas, coriander, curry powder, and a generous amount of salt. Mix together well. Taste and season as preferred. You can now start forming your cakes by placing about 1/3 cup of the mixture into your hand and shape them into the desired patty-like shape. You can either bake these on a baking sheet in the oven for 15-20 minutes at 200°C, or fry them in a pan with a little oil. They are already cooked, so you are looking for that browning of the edges. The cakes are now ready to enjoy. It is of utmost importance that these cakes are served with a spicy chutney. I like a hot jalapeno chutney which I think pairs very well with the curry in the cakes. If you make this recipe and share it on Instagram, remember to tag me @opensauce.cpt + #opensauce, I would love to see your creations! 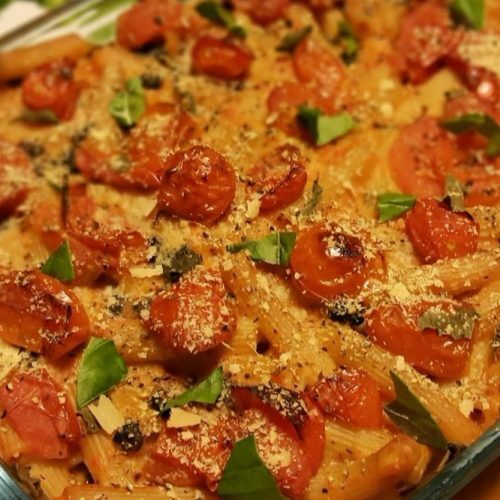 For more comfort food, check out my recipe for this Red Pepper Pasta Bake! It is a really big hit! Basil pesto is easy to make, uses only basic ingredients and turns it into a versatile addition to many dishes. And over here we are keeping it oil free and vegan. In this version I added firm tofu to bring you Basil and Tofu Pesto. Tofu adds bulk and also protein, and it’s just a different way to incorporate tofu into your meals. I also chose firm tofu for this recipe so that it remains more of a paste than a sauce which a silken tofu will provide. (If you want to create a pasta sauce, this is a great option). 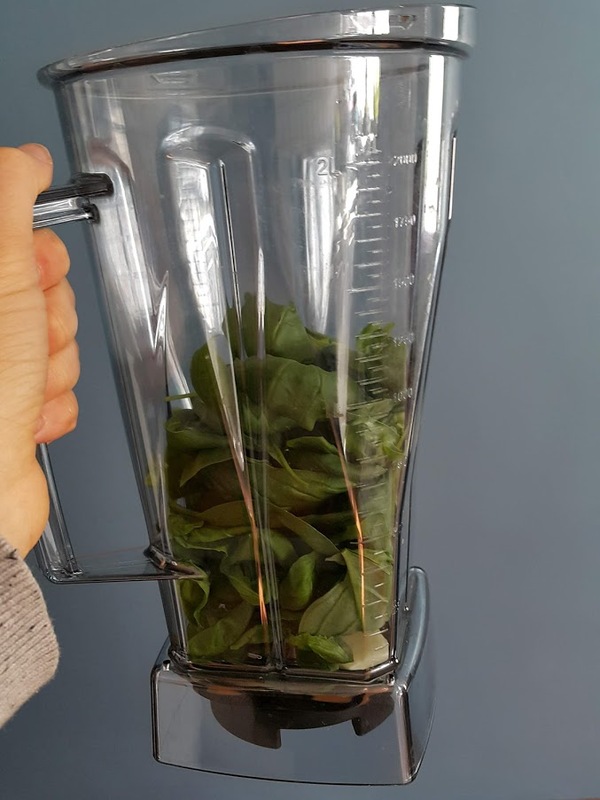 To make the pesto, I used a blender, but a food processor would probably be even easier. I used my Omniblend and found it easy to make and only had to open and scrape the sides a few times. In this recipe, I waited to add the sunflower seeds until the very end, because then they don’t blend too well and form a paste. We want to keep it somewhat intact for the texture. And keep in mind, as with all recipes, these are only guides. Feel free to adjust the measurements of ingredients to suit your palate and taste better. Add more lemon for a more lemony pesto, more salt, more garlic, more sunflower seeds, and make it just the way you like it. 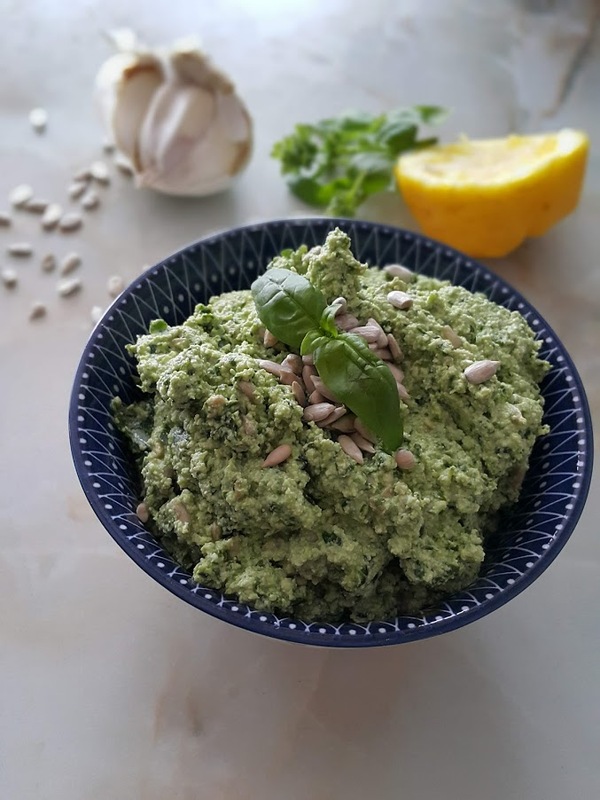 This recipe yields about a cup of basil and tofu pesto and is great with pasta dishes or as a dip or on top of soups or any Italian inspired dish! They say that pesto is the besto, especially when it is vegan and oil free. 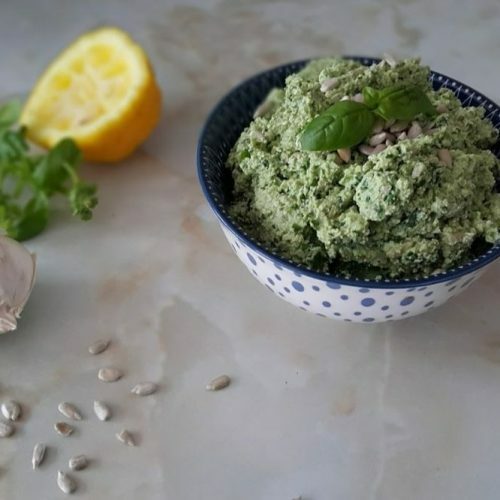 So here is a wonderfully easy recipe for a basil and tofu pesto that is packed with flavour and protein to add to any dish you want! Place the tofu, basil, nutritional yeast, garlic, lemon juice, salt and pepper into a blender or food processor and pulse until you get a consistency that is slightly smooth. Then add the sunflower seeds and pulse again until the seeds are blended into smaller bits. Adjust the taste with lemon juice, salt and pepper. I wanted to make something along the lines of mac and cheese: macaroni, a nutty sauce and tomatoes, but it turned out even better! I used four large red bell peppers to make the bulk of the sauce, and together with the tomatoes and basil, it is a flavour powerhouse! 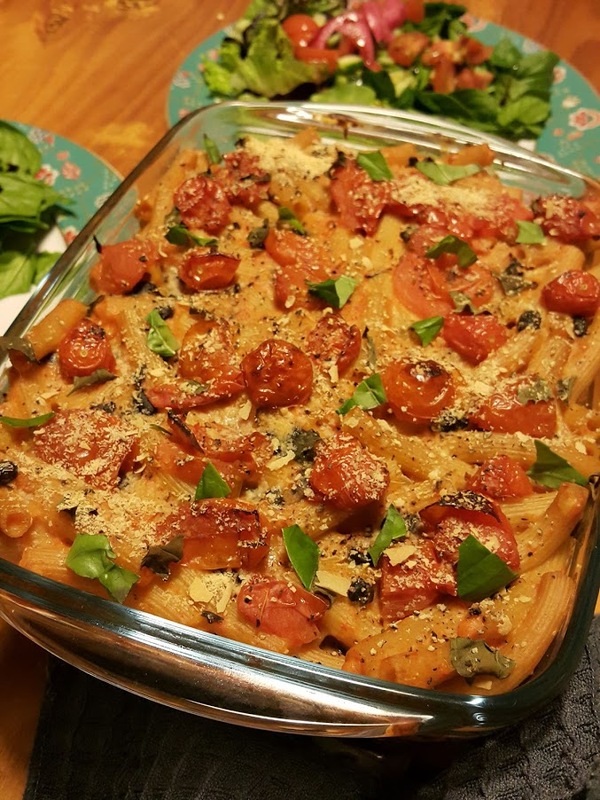 This red pepper pasta bake is perfect for a cold night in, or to take to a large family gathering. The left overs make for a great work lunch too! This dish takes little effort and few ingredients. I chose to go with a whole wheat macaroni pasta, but I am sure corn or legume pasta would work just as well. I love the taste of peppers, and roasted is even better as it brings out their sweetness and makes to sauce rich in flavour. You can use pre-roasted peppers if it’s easier for you, just make sure that it isn’t packaged in liquid containing oil. The final sauce is creamy and coral in colour. The nutritional yeast adds a nuttiness to the dish that you would expect from a mac and cheese. To up the fibre and nutrients even more, I added black beans to this dish, and as weird as that may sound, it works SO well. Trust me and try it. In the end you are left with a crispy topped red pepper pasta bake that makes for the perfect comfort food. Serve with a green salad and you are good to go! Prepare by pre-heating the oven to 220°C and roasting the peppers for about 15-20 minutes until the skin is black and blistered. Then half the cherry tomatoes and chop the fresh basil. Remove the peppers from the oven and peel the charred skin. Place the peppers in a bowl and blend them with a stick blender until smooth. Turn the oven down to 200°C. Now that everything is prepared, cook the whole wheat pasta as per packet instructions. Once cooked, drain and set aside. Meanwhile, in a separate pan, cook the tomatoes down and let the excess water evaporate. Set aside. In a medium sized pot, slowly heat the plant based milk and add the flour or mashed potato. Do not boil. Whisk the mixture continuously until a thicker consistency is achieved. Add the blended peppers to the same pot and heat thoroughly without boiling. Add the garlic powder, 2 Tbsp nutritional yeast, and salt and pepper to taste. 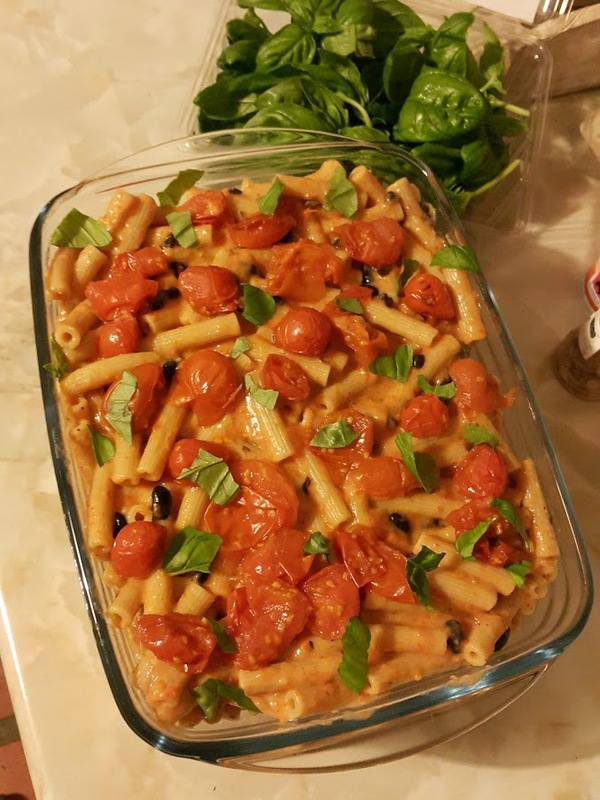 Add the cooked macaroni to the sauce together with the fresh basil, black beans and about two thirds of the tomatoes and stir until the macaroni is completely covered in the sauce. Transfer the pasta and sauce to an oven dish. Cover the pasta with the remaining tomatoes and sprinkle more black pepper over the top. Bake in the oven for 20-30 minutes until the top is crispy. Sprinkle more fresh basil and the remaining nutritional yeast over the pasta once it comes out of the oven and serve!